Preparing your personal income taxes can be, well, taxing. 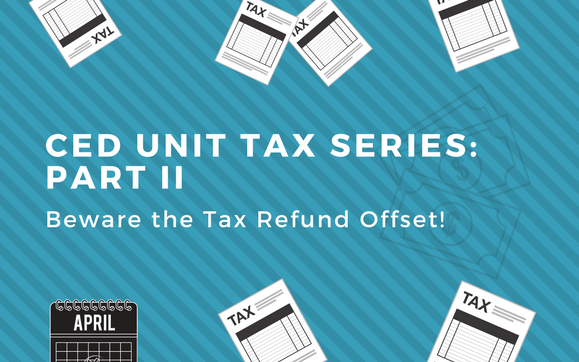 Yet for people with refundable tax credits and allowable deductions, it can result in a much needed federal and/or state tax refund. For low to moderate income working families, a tax refund serves as a safety net. It allows families to catch up on household bills, rent or mortgage payments, and loan repayments. However, your anticipated tax refund can be can be withheld if you have an unpaid federal or state debt. This is called a tax refund offset. Which debts can trigger a tax refund offset? Overdue child support that is due to a state child support enforcement agency on behalf of the custodial parent. Unpaid federal income taxes owed to the Internal Revenue Service (IRS). State debts such as income taxes, unemployment or public benefit overpayments. Overpayment of government benefits such as Social Security benefits or FEMA payouts. How will I know if a tax refund offset was issued? The original tax refund amount you are due. The refund amount that will be withheld. The name of the agency that is requesting the offset payment. Additionally, if you have not received a notice of a tax refund offset, but think you have an unpaid debt, call the Department of Treasury’s Bureau of the Fiscal Service (BFS) at 800-304-3107. As a result, you can find out if one has been put in place. I’ve received notice of a tax refund offset! You can avoid a tax refund offset if you pay the balance of all debts listed within 60 days of receiving a notice. However, if the debts are not resolved within 60 days, then FMS will take all or part of the federal income tax refund due to you. Nevertheless, you might have defenses or other options to deal with the tax refund offset. I’ve repaid the debt! You should contact the agency listed on the offset notice immediately and provide proof of payment. I’m in a repayment agreement! If you have already entered into a repayment agreement with the agency and are making payments as required, you should contact the agency to stop the tax offset refund. I filed jointly, but I’m not responsible for my spouse’s debt! You might be able to claim the innocent spouse defense with the IRS or state taxing authority. By doing so, you will request that the monies taken be returned to you. I’m using the refund to pay a defaulted student loan! You might be able to stop the offset or request the refund be returned to you by applying for a tax offset hardship refund with the agency that services the federal student loan debt. Though these defenses and remedies exist, it is better to work with the agency to which you owe the debt, as soon as possible, before receiving a tax offset.